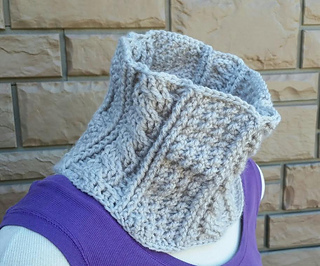 Ladies “Hugs & Kisses” Cozy Warm Cowl. 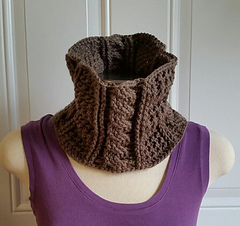 It is designed with cables for the hugs and X stitches for the kisses. The cables provide a sturdy fit and the X stitches provide comfort and movement. It’s so comfy to wear and fits the neck to keep cold out and warmth in. It is slightly scalloped around the bottom edge for fit and decoration and it fits under your chin to keep you toasty warm. This is an intermediate patter due to the cables involved.